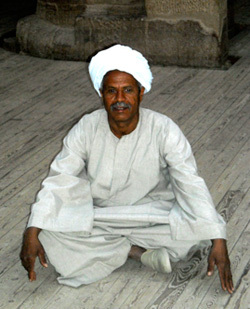 Certain grey areas remain in the history of this Egypt that fascinates us so much. How did this civilization begin? Why does the papyrus of Manetho, which provides the chronology of the pharaohs, so upset official Egyptology? Antoine Gigal gives a progress report on recent discoveries. The pre-pharaonic past of Egypt remains a very great enigma because the question remains as to what exactly occurred during the mysterious period prior to 3000 BC, date of the appearance of the first official pharaoh known as Menes-Narmer. At that time, in a few decades, without any warning, there suddenly appeared in a surprisingly perfect form, writing, perfect pyramids, erudite astronomy, technical skills and knowledge - everything that goes with a very sophisticated civilization. And it all seems to have arrived very quickly. As the English Egyptologist Toby Wilkinson put it so well: "They seem to have no ancestors or periods of development, they seem to have appeared overnight." The French authority Gaston Maspero (1846-1916) comments about the Egyptian texts: "The religion and the texts which made it known to us were already established before the first dynasty. In order to understand them it is up to us to put ourselves in the frame of mind of the people who constructed them, more than seven thousand years ago." (Revue de l'Histoire des Religions, vol. XIX, p.12). Yes, that's what it says: "before the first dynasty"! The ancient Egyptians viewed their civilization as a legacy coming directly from divine beings who existed in Egypt thousands of years before the pharaonic dynasties that we know about. 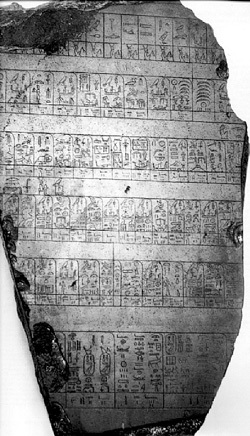 The papyrus of Turin (or more exactly the royal canon displayed at the museum of Egyptology of Turin), written in hieroglyphics and dating back to Ramses II, presents a list of all the pharaohs who reigned in the land of Egypt. This list includes not only the historical pharaohs, but also the "divine pharaohs who came from elsewhere" who reigned before the first dynasty of Menes. We are also told that this preceding lineage reigned for 13,420 years! It's hard to overlook this, yet a kind of consensual omerta reigns on this subject in official circles, which prefer to regard this lineage as mythical, thus making the subject easier to evade. Actually 160 fragments of this document were taken to Turin by the Italian Drovetti, French Consul in Egypt in 1822, though strangely enough certain fragments representing the whole beginning of the list are missing. In his day the brilliant Champollion was aware of the true importance of this document in establishing accurate dating. The basalt Palermo stele from the Old Kingdom, on the faces of which were inscribed the annals of the reigns of the high Egyptian period (the Ist-5th dynasties). Several incomplete fragments of this stele have been found, the most important being preserved in the museum of Palermo in Sicily. 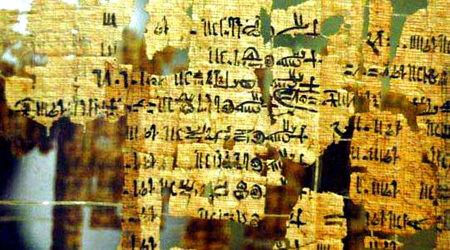 A fragment of the Turin Papyrus. Fortunately the Palermo stele also cites these so-called "mythical" pre-dynastic kings going back thousands of years. It refers to Horus himself as having reigned over the land of Egypt. According to Manetho, Thoth reigned approximately from 8670 to 7100 BC, "after the night of the battle". Hesiod, the renowned historian and moralist living at the time of Homer (8thC BC), obtained most of the information he recorded in his Theogamy, a genealogy of the dynasties known as celestial that reigned on Earth, from the Egyptian high priests. The Egyptian High Priest Manetho (Ma-n-Thoth) from Sebennytos in the Delta, Master of the Secrets (3rdC BC), who had access to the library of Alexandria and who wrote for the pharaoh a history of Egypt in Greek in 30 volumes, the Aegiptiaca, also cited these pre-dynastic dynasties of divine origin. What is curious but significant is that today's Egyptologists still use Manetho's dating, which is considered perfectly reliable for everything related to the "officially" recognized dynasties; but they carefully avoid anything that relates to the prehistoric dynasties, while still regarding him as the "Father" of Egyptology! Strange intellectual acrobatics in order to remain "politically correct"! Mainstream Egyptology avoids talking much about Manetho, because they find some of the details he gives extremely disturbing. Manetho gives us very interesting details on the dynasties called "divine", which he divides into three categories: Gods, Heroes, and "Manes". He also explains that the category of the Gods was divided into seven sections, each having a god at its head, including Horus, Anubis, Thoth, Ptah, Osiris and Ra, and that "these gods who originated from Earth then became celestial and associated with the stars as they reached heaven". (It does indeed say "originating from Earth" - and there is undoubtedly much to be discovered in the subterranean realms of our planet.) Next are the Heroes, beings with supernatural terrestrial powers, and finally the "Manes" (also called "Khus"), glorious beings corresponding to the spirits of ancestors revered in other cultures. Osiris himself says, in The Book of Coming Out by Day: "The tunnels of the Earth gave me birth." And according to Plutarch, who wrote a very erudite work on the cult of Isis and Osiris, "Ra departed to the heavens and Osiris became pharaoh of Egypt with Isis and they built Thebes [the present Luxor]". Finally there are many pre-dynastic genealogies cited by many serious scholars of the early years of our era, like that of Eusebius, bishop of Caesarea in Palestine, and that of the most important Byzantine chronicler, Syncellus, residing also in Palestine. All these sources speak to us about a lineage of gods who reigned each one for several hundreds of years, for a total of 23,200 years, then of a list of "Shemsu Hor", called "Followers of Horus", who reigned for 13,400 years. Then come the names of the "normal" Pharaohs whom we know. The fact that divine and semi-divine sovereigns could each have reigned hundred of years is unacceptable in our view of things, but we should ask ourselves why we accept without flinching the hundreds of years of life of the people and prophets of the Bible, such as Enoch who lived over 360 years. Many factors explaining a much slower aging process can be understood today through science: different terrestrial gravity, lower density, or better protected or different DNA, or other ways of measuring time. There are many theories that could justify such life spans. 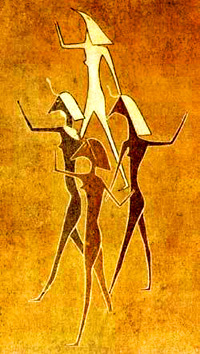 It was during the period of the strange Shemsu Hor (from 4000 BC) - these "companions of Horus" described wearing masks of falcon or wolf, whom we imagine to be the initiators of the Pharaonic dynasties (though as we shall see they were not really so) - that there suddenly appeared an unequalled degree of sophistication and a remarkable civilization in its entire splendour. It was the researcher and philosopher Schwaller de Lubicz (1887-1961) who, to my knowledge, generally "imposed" the translation of "Shemsu Hor" as "Followers of Horus", which has been taken up by thousands of others since. He thus understood that very advanced people arrived in Egypt at prehistoric times and suddenly brought all the knowledge. Following this widely held belief many authors, including the prolific Zecharia Sitchin (thinking that it referred to the Annunaki who had arrived first in Sumer), thought and wrote that this advance was due to the sudden arrival of beings from elsewhere, some kind of extraterrestrials. However, it is not only wrong and far more complicated than that, but it is even more extraordinary. 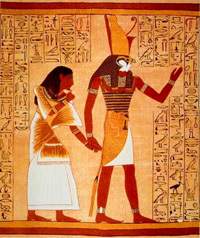 Horus in human form imparts life to the Pharaoh. 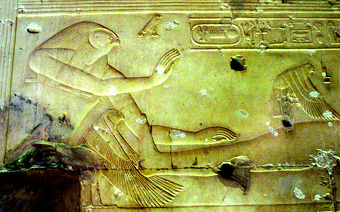 Horus watching over the resting Pharaoh, temple of Seti, Abydos. The noble Tera-Neter of the Anu, from William Flinders Petrie, The Making of Egypt, 1939. In any case the Anu knew the use of metals and ivory, they were very organized and knew how to write. This was proven by many artefacts found by Amélineau in the region of Abydos and described in his Nouvelles Fouilles d'Abydos. The archaeologist pointed out: "If Osiris was of Nubian origin, although born in Thebes, then it would be easy to understand why the fight between Osiris and Seth took place in Nubia." (Prolégomènes, pp.124-5). Let us not forget that according to certain researchers, Anu is a term applied to Osiris himself. 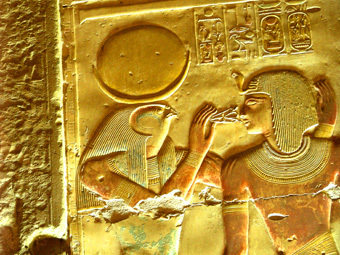 Amélineau comments that it was "in an ethnic sense that we must read the term Anu applied to Osiris." He also quotes a passage from Chapter 15 of The Book of the Dead (of which the real title is The Book of Coming Out into the Light): "O Thou God Anu in the mountainous land of Antem! O Great God of the double solar mountain!" It was the name of Osiris in his role as fourth Pharaoh on Earth which the Greeks translated by Onnuphris, that is to say, "the Good". We have an extraordinary object from pre-dynastic Anu found by the great English Egyptologist William Flinders Petrie (1853-1942) in Abydos. It is a glazed and inscribed earthenware tile, unearthed from below the dynastic temple. 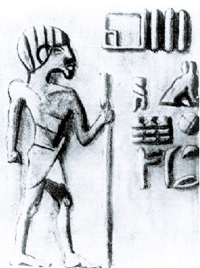 The inscription bears the portrait of the Anu ruler, Tera-neter. There is even his address at the top: "Palace of the Anu at Ermant, Tera-neter." But the Anu are only one contribution to Egyptian civilization. There are others, as is being revealed more and more with the latest archaeological discoveries in the south of Egypt. We should include also the Mesnitu (whom certain researchers identify with the Shemsu Hor) who came from Punt, more precisely from Somalia. Their land was called Ta Neteru ('the land of the gods'). They were mostly metal workers and blacksmiths and ended up eventually dominating the Anu and their Nubian land Ta Seti ('the land of the bond' or 'the land of the prow' according to translation) of Sudan. Gradually the two lands were assimilated into one, Ta Khent ('land of the beginning'). The physical difference between the Anu and the Mesnitu is noted in their jaws: those of the Anu are rounder and short whereas those of the Mesnitu are square like that of Narmer-Menes. But there are also sub-groups within these two groups, such as the Beja (among the Mesnitu) and the Rekhytu people in north (who arrived in the valley of the Nile by Coptos) and groups supporting or mixing with the Anu coming from Sinai and Libya. 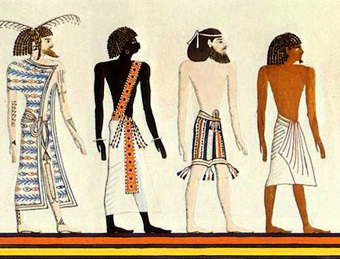 The history is complex because there are yet more groups of various origins: the Aamu of Asian style but dressed like Egyptians and living in the mountains of Egypt; the Nehesy, living beyond present-day Sudan, the Temehu of the Western Desert, Libya and the northern coasts of Egypt. All these people were not just simple aboriginal hunters as some think. They had great knowledge and organization; but then where did their knowledge come from in such remote times? Let us examine first the tangible evidence. Human fragments accompanied by signs of civilization, the oldest that archaeology has uncovered in Egypt (though in the coming months we may find things much older still), have been found 250km south of Aswan at Qadan, in ritual burials officially dated to 13,000-9000 BC. It is an undoubted fact that these people were not just simple aborigines; they had tools and knowledge of agriculture and complex rituals. Though this is not yet the high sophistication that we are looking for, we can see that they were much older than the Sumerians and even the Ubaid before them. It is high time that people realized that civilization on Earth probably did not begin in Sumer (an assertion imposed in the 19th century in the biblical context); the story is much more complex than that, as indicated by new evidence coming to light on all sides. I cannot resist announcing the discovery on 7 May 2009 by a Belgian team, in a mountain cave close to Denderah in southern Egypt, of a skeleton probably dated between 30,000 and 33,000 years ago. And that's not all: the skull was turned towards the east, and several pots were found around the remains, proof of a certain level of culture. But let us return to the research concerning the group of people with sophisticated knowledge who were apparently much more advanced than others in the arts of civilisation, and who disappeared from Egypt in about 4000 BC. Professor Walter B. Emery (1903-1971), an excellent archaeologist with 45 years of experience excavating in Egypt and author of the book Archaic Egypt, found in certain tombs the remains of people who lived in pre-dynastic times in the north of Upper Egypt. The features of these bodies and skeletons are incredible. The skulls are of abnormal size and are dolichocephalic, i.e. 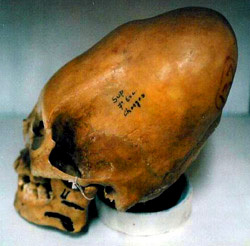 the cranium as seen from above is oval, and is about 25% longer than it is wide. Some skulls show no sign of the usual sutures. The skeletons are larger than the average for the area and especially the skeletal frame is broader and heavier. He did not hesitate to identify them with the "Followers of Horus" and found that in their lifetime they filled an important priestly role. With regard to the long-headed skulls, it seems that it is not a prehistoric lineage of evolution but rather a lineage coming from a cycle of civilization from before the Flood. These enlarged skulls have already been found in several regions of the world. Dr. J. Von Tschudi and Mariane E. Rivero in Peru have indentified three pre-Inca dolichocephalic races, the Chinchas, Aymaras and Huancas. They also found that if the Chinchas had a lengthened skull it was because they bandaged the skulls of their children in order to resemble the two other groups, who did not bandage their skulls. They managed to work out that the original group with the most marked natural characteristics were the Chinchas. They preceded the first Inca, Manco Capac, and probably influenced both the Incas and the Maya in later times. Researchers A.H. Verrill and Posnansky point out that the oldest pre-Inca city in Peru, Tiahuanaco, dates from the same time as pre-dynastic Egypt, and enlarged skulls of this period can be seen in Tihuanaco Museum. It is therefore asserted that there once existed an antediluvian race that has been found here and there all over the world, a race that had a naturally elongated conical skull, as affirmed by some researchers, among them Dr Tschudi, who possesses a fossil from that time of a 7-month-old foetus with a dolichocephalic skull still in the womb of its mother. 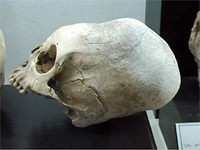 Dolichocephalic skull. Dolichocephalic skull in the Regional Museum in Ankash Huaraz, Peru. All this is far from being "politically correct" because these facts call into question genetics, the history of evolution and beliefs based on the Bible. It is thus only very slowly that people absorb these new but fascinating facts. To cite one example, dolichocephalic skulls have been withdrawn from public view in the museum of Valetta in Malta, undoubtedly to avoid offending the religious sensitivities of some people. Indeed, about 700 of these skulls were found in Malta in the hypogea of Hal Saflieni and the tombs of the megalithic temples of Taxien and Ggantja. It was Dr Anton Mifsud and Dr Charles Savona Ventura who analyzed the skulls and came to the same conclusion as in Peru, identifying three different groups, some of completely "natural" origin, and others that had been bandaged. This is another even closer link with Egypt. The former name of Malta is Melita, from the Latin mel, 'honey'. The symbol of Malta is a bee with its hexagonal honeycomb. Let us not forget that the symbol of the pharaoh in Egypt is also the bee ('bit') which gives him one of his titles. Honey was reserved for the Pharaoh and the chief priests, and Mel (or Mer) was one of the names given to the pyramids in Egypt. In addition, sun worship prevailed in Malta as in Egypt, and the dolichocephalic caste disappeared at the same time in both countries. In my own research, I've found that there was very probably a migration of these long-headed people from Egypt to Malta, and traces of them are found in Cretan civilization. Be that as it may, this race that seems to have been devoted to the priesthood and teaching, and that kept itself more or less separate, had one point in common everywhere: the building of megalithic monuments. It formed a dominant priestly caste wherever it was. Could these people really be the descendants of an antediluvian race? Perhaps. But are they the famous Shemsu Hor? It's not certain. The Egyptian hieroglyph of the bee at Luxor, a link with Malta. Today, what says the oral tradition, still alive among certain Egyptians who have been initiated from generation to generation? It says that the term "Shemsu Hor" has been very poorly translated. The meaning "Followers of Horus" is not convincing. For them, the word is initially "Sheshu Hor" and indicates in very early Egyptian, "the evolved principle of man". 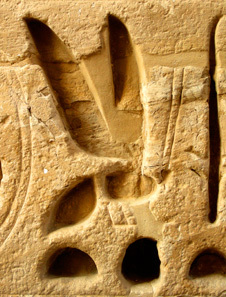 The phrase "Zep Tepi" that Robert Bauval and Graham Hancock have translated as the "First Time" is for them, and for the British Egyptologist E.A. Raymond, to be translated as "when the gods manifested as humans". The exact sentence found on the walls of the temple of Edfu is: "Ntr ntri hpr m sp tpy", that is to say, "the sanctified god who came to be born at the first time". The keepers of the oral tradition say that these words refer to a time when the divine appeared among humans to raise their consciousness. They say that the humans of that time in Egypt, the Shesh people (whence 'Sheshu Hor'), organized into 42 tribes (which gave later the 42 nomes or regions), were beginning to lose their subtle senses. Indeed, if we now have our five senses today, according to the wisdom keepers at that time we had 365! We have really lost so many of them! The divine beings manifested more and more at that time to try to halt the degradation and the loss of senses among the Shesh, and to try to preserve the communion with the 360 Neters or "the 360 principles of divine creation" (wrongly translated as "gods", as they say). Thus there were in the beginning the Shesh people, consisting of 42 tribes (including the Anu) of various origins, having united and having had prestigious ancestors like Anubis, Osiris, etc., and also a mysterious dolichocephalic race of which we know almost nothing. One thing is certain: Egypt was an incredible melting pot of mixed races and it will be necessary to make a further serious study of the origins of these people. It is already known from all the documents of ancient Egypt that "the Egyptian people came from the land of Punt". Researchers today are struggling to give this place an exact geographical location, placing it in turn in Ethiopia, in Sudan or elsewhere. To my mind the richest and most convincing thesis is that of the Director of Research at the François Daumas Institute of Egyptology, Dimitri Meeks, who places Punt in Arabia. This is the only fully convincing theory in the light of the texts, and as soon as we can conduct research over there I am sure we will learn much more about the early Egyptians. But the researchers will have to become more open to a new paradigm, that of a very advanced civilization existing long before the last Flood. Émile Amélineau, Nouvelles Fouilles d'Abydos, 1895-6, 1896-7 & 1897-8 (full report of the excavations), Paris: Ed. Leroux, 1901, 1902 & 1904-5. Émile Amélineau, Prolégomènes à l'étude de la réligion égyptienne, Paris: Ed. Leroux, 1916. Arthur Posnansky, Tiahuanacu, New York: J.J. Augustin, 1946. Randy Koppang, "The Dolichocephaloids: Missing Race of Our Human Family", www.paranoiamagazine.com/articles.html. Anton & Simon Mifsud, Malta Dossier, "Evidence for the Magdalenian", Proprint Co., 1997. C. Soaped Ventura, Anton Mifsud, Prehistoric Medicine in Malta, Proprint Co., 1999. Anton Mifsud, C. Soaped Ventura, Facets of Maltese Prehistory, Prehistoric Society of Malta, 1999. Graham Hancock, Fingerprints of the Gods, Corbaccio, 1996. David Rohl, Legend, Piemme, 2000.